A residual Pressure Valve should be used when the Master Cylinder is mounted below the height of the calipers or when drum brakes are used. The RPV stops fluid from draining back into the master cylinder which can cause an increase in pedal stroke. 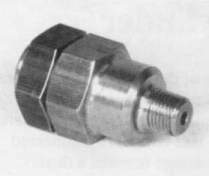 Connectors are available in straight ,elbow or T-type styles. Printed on white adhesive backed paper. Measures 8.5 inches (225mm) wide by 3.5 inches (95mm) high.